Typing SetupExtender.net into your browser should have brought you to the setup interface for your Motorola Range Extender. Instead it brought you here. There are a few reasons why this may have happened. Your device is connected to your router, not your range extender. On your wireless device’s setup page, disconnect from your wireless network and select the extender’s wireless network. 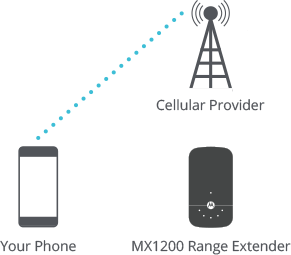 If you haven’t set up your range extender yet, connect to the wireless network named MOTO-EXT. If your range extender is already connected to your router, the range extender’s wireless network name is your router’s wireless network name plus -EXT. For Example, if your wireless network name is MOTO3C88 then the range extender’s wireless network is MOTO3C88-EXT. You should connect to MOTO3C88-EXT to access the setup interface of your range extender. You are using your phone’s browser and are connecting directly to your cellular provider, not the range extender’s wireless network. Turn off cellular data on your phone and try connecting again. If the above 2 methods didn’t work, you may be able to connect your device directly to the range extender using the included Ethernet cable. You can also call our support specialists at 800-753-0797. © MTRLC LLC 2018. MOTOROLA and the Stylized M Logo are trademarks or registered trademarks of Motorola Trademark Holdings, LLC. and are used under license. All other trademarks are the property of their respective owners. All rights reserved.